At the end of last year, we released the first beta version of our upcoming Phonebook API in a longer series of Application Programmable Interfaces (API's) that allow you to extend Messente's capabilities outside our Dashboard. The first feature available in Phonebook API is the /blacklist/ endpoint. In addition, we will be soon releasing another feature before the full release of the API. But for now, let’s talk about the blacklist. Think of the Blacklist as your friendly Security Guard on the door who scans all passers-by and stops everyone on his list. 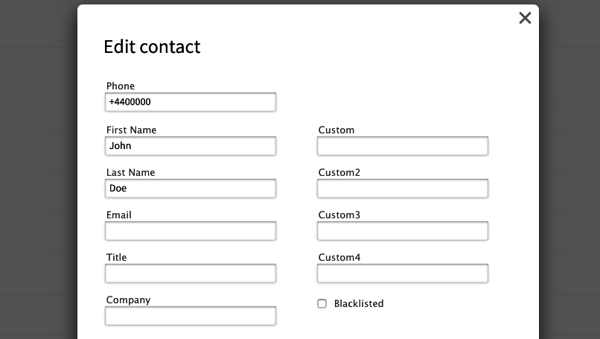 Now, instead of having to search the number in Phonebook and checking the checkbox, you can use the Phonebook API to automatically add any number instantly to the Blacklist from your CRM. Of course, you can also remove the numbers from blacklist or fetch the whole blacklist - just refer to the Phonebook API documentation page. Having the new building blocks provided by Phonebook API, you can make use of the Blacklist in numerous ways. If you are using the Blacklist in some other way to improve your workflow, share it with us in the comments section below! If you already have your Messente API username and password, you can use the existing credentials to make requests to phonebook API. For new users, just sign up for your free Messente account on the Registration page - no credit card details needed! As you may have guessed, blacklisting will not be the only feature Phonebook API supports. In upcoming months, we will be releasing the full Phonebook API functionality that allows you to manage your contacts and groups using the same API.